For most couples, the journey to “I Do” starts with a singular, unending promise – symbolized by the exchange of an engagement ring. Beyond just being beautiful, jewelry helps us convey a sense of self. Your wedding bands will have a key role in your ceremony, but depending on your personal style, that may just graze the surface of your marital bling! To help you sparkle and rock your special day, we’ve rounded up some of our favorite trends and sat down with our go-to jewelry experts at Pro Gems in Chicago. So, where to start? According to Dhanani, the most common jewelry to complement a bride’s look is a set of diamond earrings. Necklaces and bracelets are also popular. And – there’s no shortage of options – men’s jewelry is trending, statement pieces have taken on a life of their own and the best news – matchy-matchy is out. Brides and grooms have freedom to express themselves through their accessories and even to pair a shiny new bauble with a family heirloom that holds special meaning. Second only to a bride’s radiant smile is her gown – so her day-of jewelry should serve to enhance the overall look – not overpower it. When selecting sparkles, consider the gown’s neckline and structure. For example, intricate details on the bodice or architectural detailing are statements in their own right, and the beautiful bride may be best advised to skip other attention-grabbing pieces. Similarly, if you have your heart set on a stand-out necklace, let that piece shine by going light on other accessories – nix the chunky bracelet and select simple pearl or diamond studs in place of chandelier earrings. Uncertain which accessories to feature and what to ditch? Ask your most stylish family and friends to weigh in – and lean on the expertise of your jeweler or bridal stylist. Above all – select pieces that make you feel glamorous, confident and are in line with your personal style. MAE's Tip: We also recommend you read up on the latest wedding jewelry trends to inspire you before the shopping begins! Looking to mix in a pop of color? Dhanani says blue sapphire is on-trend for your “something blue” and rubies are a classic go-to to add romantic red to your Wedding Day look. And remember, you have your whole wedding day, and night, to shine. Consider wearing more traditional jewels at your ceremony, and then, stunning guests with a statement piece for your reception – or swap your veil for gorgeous and unexpected hair jewels. “Men’s jewelry is very popular right now, and the focus is on classic pieces that they’ll wear for years,” says Dhanani. In addition to a beautiful wedding band, Dhanani says custom-made cufflinks for grooms-to-be are popular and chains and pendants are making a come-back. We at MAE are firm believers that every groom deserves to feel extra dapper on his special day and love that men’s hardware is stepping into the spotlight. From gorgeous wrist-watches and timeless pocket-watches to tie bars, shirt buttons and belt buckles – there’s no shortage of opportunities to bring that suit-and-tie to the next level. For many grooms, your wedding band may be your first fine jewelry purchase – and might be the only piece of jewelry you’ll wear every day. So – how to choose? Dhanani says that the most popular bands are of tungsten, titanium, white gold and platinum – and he gave us the 411 on each. Tungsten: As one of the hardest metals on earth, tungsten won’t scratch or break – it’s heftier in stature than precious metals and styles are typically modern and have a nice weight to them. Titanium: Titanium is also favored for its strength and scratch-resistance. In contrast to tungsten, titanium is a very lightweight metal, and may be more comfortable for some. Additionally, titanium tends to be hypoallergenic and a great option for men with skin allergies. White Gold: A precious metal, white gold is more expensive than tungsten and titanium. While white gold and platinum look almost identical, white gold is lighter weight, which may be preferred. Because white gold is a composite metal (typically about 60% gold at 14k and 75% gold at 18k) – you may need to polish occasionally as it will naturally fade to gold over time. Polishing the ring will bring back its original brilliance. Platinum: Platinum rings are typically 95% pure platinum, making them heavier than white gold, and more expensive. Because platinum is naturally white, its color will not fade, although you may still want to polish it occasionally. Some men however, prefer the natural weathering of platinum. As a soft metal, it will scratch, but does so in a unique way – creating a lovely patina that provides a weathered, antique-looking sheen. The moral of the story is that your wedding day accessories are the “icing” on your overall look. They should make you feel more special and beautiful than you already are. Whether simple and classic, or show-stopping – go for what you love! While custom pieces are an investment, they will also have sentimental value for anniversaries – and even generations – to come. If you’re considering commissioning a special piece, Dhanani says that you won’t need to come prepared with your full vision in mind. Your jeweler should be able to guide you through your different options and work with you to achieve the look you’ve been dreaming about (and if not – find one that will!). MAE's Tip: To ensure your jewels are at their pinnacle of sparkle – Dhanani recommends a deep clean of any jewels that have been previously worn (including your engagement ring!) one week before your wedding. Once clean, wear your jewels as sparingly as possible until the Big Day. 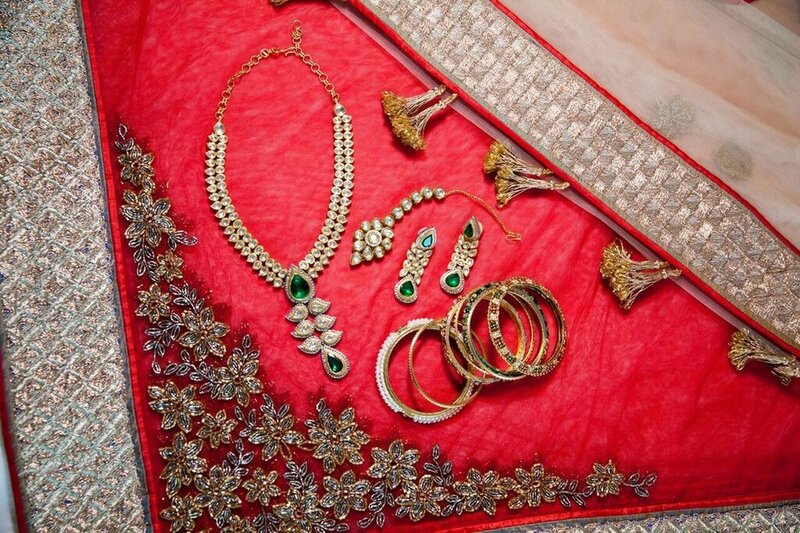 Following your wedding, Dhanani recommends having your fine jewels and metals professionally cleaned once a year. As planners, we are even known to carry our own jewelry cleaner on hand for your Wedding Day! To see how Marquette Avenue Events can help you find the perfect jewelry to complete your wedding day look and most importantly, assist in the planning of your dream wedding please visit us at www.marquetteavenueevents.com or call us at 312-585-7265.